Growing up in the '80s, there were three big Als in my life: Alan Alda from M*A*S*H, 'Weird' Al Yankovic, and Alice Cooper. I never had the chance to meet Alda, but my first two concert experiences in the early '90s were both 'Weird' Al, so I had plenty of opportunity to tell him that I'm not worthy. 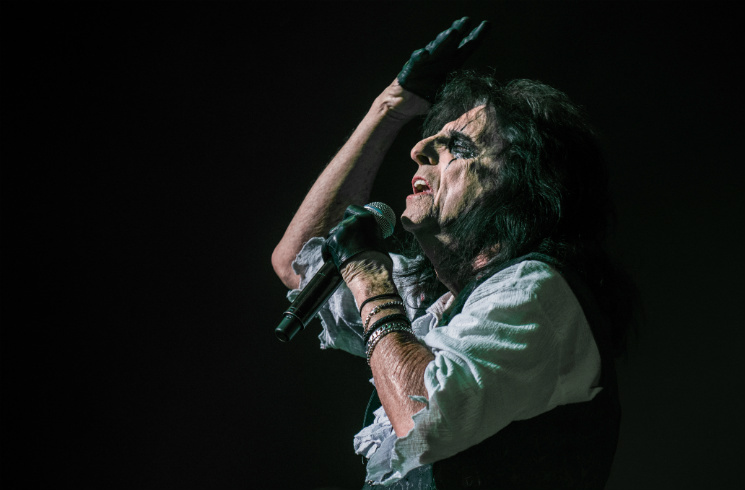 Yet, in all these years since, I'd never seen Vincent Furnier, the architect of shock-rock, don his eyeshadow live until 2016's intimate Spend the Night with Alice Cooper tour, which hit Vancouver's Queen Elizabeth Theatre last night (October 19). So much of my life seemed drawn to this moment. My grandfather died four days before this show, and I remember watching Cooper kill it on The Muppet Show in his basement. In the Queen Elizabeth's lobby, the sight of a couple accurately dressed as Wayne and Garth sent me back to seeing Wayne's World with my dad, during the film's original theatrical run. My first ever CD was the soundtrack to that movie, featuring "Feed My Frankenstein" from Cooper's 1991 album, Hey Stoopid. Around that time, I convinced my fifth-grade teacher to let me play a song during the last day of classes; that she subsequently made me stop "School's Out" halfway through only makes the memory sweeter. Clearly, from the enthusiasm and joy buzzing throughout the crowd, my story is similar to most. The guy behind me in the lengthy line at the merch booth had first heard of Alice Cooper in 1976, and had seen him live every time he came to Vancouver since the Raise Your Fist and Yell tour in 1987, notably bragging about seeing him at the Pacific Coliseum in 2010 during The Gruesome Twosome Tour with Rob Zombie, in which Cooper was "killed" onstage five times. This "evening with" show took place in a much smaller space than the Coliseum, so the demented master's stadium-sized onslaught of hard-rock carnage would not be unleashed here. Getting to see him up close and personal made up for it, though. Much hullabaloo was made over the tour of undersized venues that Prince undertook in 2013, and so was this tour deserving of such buzz. Cooper hasn't released a new album since 2011, so the real draw of this show was to see a legend of his stature within spitting distance, even if he only ended up being killed once or twice. Certainly, there were still more than enough antics to make Ann Landers blow chunks and bolt. Unlike many of his peers, Furnier has managed to live some five decades past the age of 18, but he won't be around to play Alice forever. Nobel Prize-winner Bob Dylan thought Alice Cooper was an overlooked songwriter in 1978, and we mustn't make the same mistake now. Truly, Cooper is an amazing showman, the likes of which have become quite rare in these stuffy, cynical times, where so many musicians take themselves way too seriously. His show is a spectacle that works hard to earn its $60-$120 price tag: fireworks, fog and a broken toy rainbow clown tossing him articles of clothing from a tickle trunk. He waved off a stack of money pierced with a sabre during "Billion Dollar Babies," transmogrified into a giant monster for "Feed My Frankenstein" and broke out a samurai sword and sharp daggers to bust confetti balloons during "School's Out." Even "Cold Ethyl" made an appearance; she's still dead. However, the theatrical horror lunacy of Cooper's style didn't overshadow the many cathartic, and even breathtaking moments that are peppered throughout his 26-album-deep songwriting catalogue. Even though he can't hit the highs like he used to, his soulful rendition of "Only Women Bleed," which featured gorgeously heavy choreography with his abused wind-up ballerina, still moved me to tears. "No More Mr. Nice Guy" remains one of the best sings ever written to get fired up to, while "The World Needs Guts" is damn near poetry. Somehow, even well past retirement age, songs like "I'm Eighteen" and "School's Out" still ring true coming from him. He is a treasure, and his lustre hasn't dulled. Although much of his band hasn't been with him very long, they had the chemistry of a league of heroes. The rhythm section was epic. Veteran bassist and occasional lead vocalist Chuck Garric, who has played with Cooper since 2002, looked like Gríma Wormtongue if he joined the Night's Watch, and he performed with the level of theatrical intensity you'd imagine for that role. Drummer Glen Sobel demonstrated all the reasons why he's been touring with Cooper since 2011, twirling his sticks whenever possible while sitting atop a high riser covered with weird doll heads and such, his double kicks staring the audience down with their painted red eyes. Midway through the set, Sobel unleashed a drum solo of Algar-ian proportions, which covered the costume change transition into "Feed My Frankenstein" so well that you wished it would never end. Sharing backing vocal and guitar duties, emo Tommy Henriksen and hippy pimp Ryan Roxie spent much of the night flanking the stage, allowing the band's newest member, Nita Strauss, to consistently steal the show. Servant to the dark lord since 2014, Strauss constantly flicked picks into the crowd, helicopter-whipped her guitar around her neck by its strap, and worked the stage from one side to the other, effortlessly bounding across it like a majestic rock antelope. When Roxie took a solo during "Long Way to Go," she got the audience clapping the rhythm for him, and when she let loose a well-deserved solo after "Woman of Mass Distraction," the melted faces of the crowd pooled in streams down the aisles. Together, near the end of the set, they raised the dead — specifically, Keith Moon, David Bowie and Lemmy in their medley of "Pinball Wizard," "Suffragette City" and "Ace of Spades." In hindsight, rolling "School's Out" into Pink Floyd's "Another Brick in the Wall, Part 2" was so obvious, you almost wonder why it wasn't always done that way. Going out with a bang, Cooper's encore brought out caricatures of Donald Trump and Hillary Clinton in bloody, tattered clothes, who proceeded to abuse and titillate each other during his take on "Elected," a song that came out during Nixon's re-election campaign yet still remains relevant. This made as good a case for his own presidency as almost anything said on behalf of the proposed candidates. Vote Alice, and make America sick again.